Tennis, I've played for about 40 years; piano for 3 years; and ballroom dance, I've done for 2 and a half years. One might normally expect that proficiency in tennis, for example, would help improve one's dance because of good physical conditioning, but what was unexpected was how similar the body actions of the two activities (tennis and dance) are and how dramatic the effect performance in tennis might have on performance in dance, and vice versa, or how playing the piano can help one's tennis. In this article, I will mention some of the subtle similarities and actions amongst these three activities and how they effect and help to improve one's performance in each activity. Similarities between dance and tennis are obvious, such as the need for good footwork and conditioning. Research in Denmark has shown that dancesport competitors have the physique and stamina equivalent to middle distance Olympic runners, such as those in the 5000 metre class. Many casual ballroom dancers say they do the activity because it's their form of exercise, done in pleasant settings to enjoyable music. Even in an air-conditioned dance hall, one can work up a heavy sweat when dancing with intensity. In a one-hour tennis match, whether singles or doubles, the ball and the players are in actual play for only about 10 minutes. Yet in one hour of normal dance, one is probably actually dancing for 30 - 45 minutes, assuming that each dance music is about 3 minutes, and in between dance is about one minutes (just like the interval of a boxing match). Tennis requires spurts of activity, speed, and exertion, and it's the accumulation of these items that build stamina. Dance requires lower levels of speed and exertion, but at a more consistent level for longer continuous periods. The body movements of tennis and dance are remarkably similar, and I will use just a few examples to show this. 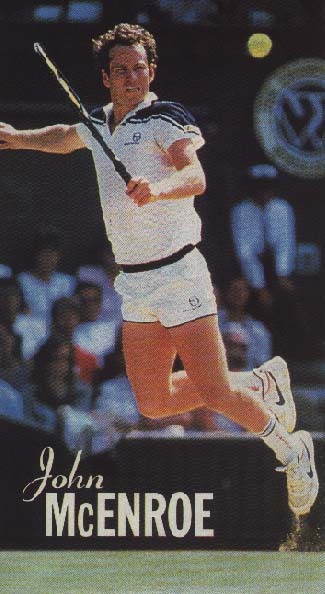 For a right handed tennis player, the follow through of a forehand will end with the player's body coiled to the left, the weight mostly on his left foot, left leg slightly bent, and his right racquet arm across his upper torso. This position, in dance, is the Contrary Body Movement (CBM), and is the initial movement of a Forward Turn to the Left. CBM is one of the more difficult dance movements to master, but a tennis player might find that CBM is a very natural action and easy to do. CBM when done well is a beautiful and delightful movement to watch, and not many male dancers can do it well, because CBM is a not a natural action for the body to take. Another example is the forehand volley for a low ball. The normally recommended form for this volley is, for a righthanded player, to keep the upper body fairly upright and erect, the left leg forward and bent, weight mostly on the left foot, the right leg behind and slightly bent for balance, right arm bent at the elbow, and the forearm and racquet fairly parallel to the ground. This form, though is exactly the position that should result when the male does an oversway action in slow waltz, tango, or foxtrot. See the two photos below and compare the body form of the male dancer with that of the tennis player. The two forms are practically identical, with the main difference being that the dancer is slightly more upright than the tennis player so as to provide the proper frame for the female partner, and the right leg of the dancer is straighter to give a better looking body line, whereas the tennis player's right leg is slightly bent for better balance. Note also the similarity between the follow-through of the baseball player's swing and the body position of the female dancer. These two body shapes end up looking almost alike, even though they start from different positions - the batter's swing coming from a clockwise movement, and the female dancer from a counterclockwise movement. 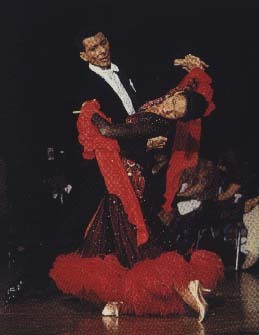 In tango, there is a very dramatic action where, in the classic tango stance, the two dancers snap their heads and slight snap of the body in time with the music. This action is the very embodiment of the sharp tango movement, and never fails to bring applause and oohs and aahs from any spectators. This snapping action has an identical feel in tennis, when the player is at the net, and executes, especially, a backhand volley to cut off a passing shot. This snap arises from the body already being tensed in anticipation of the ball coming, then slightly drawing the racquet back and across the body, and punching the ball back across the net with a snapping action of the arm and racquet. It is this snapping action of the volley that is identical to the snapping action of the head and body in tango. 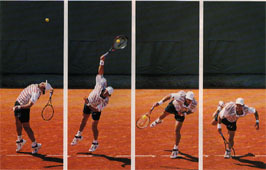 The two rightmost photos above show the classic tango hold, and Patrick Rafter executing a backhand volley. For a final example, the rise of the foot to the toes and the extension of the body in the serve in tennis has an identical movement in the paso doble dance where the male rises and fully extends his body with both arms high above his body. Now, perhaps you can understand better why the ballroom dance association, The International Dance Sport Federation, refers to competitive ballroom dance as "Dance Sport". It is very athletic in its demand and execution. As between tennis and piano, the similarities are less subtle, but still there nevertheless. One often hears the phrase, "He (as in John McEnroe) has or plays with soft hands." When volleying in tennis, a stop volley is achieved by softening the grip on the racquet, and a hard volley is achieved by tightening the grip on the racquet at contact with the ball. It's the feel of the fingers on the racquet that results in a soft or hard grip. Playing the piano helps develop that feeling in the fingers. On the serve, a consistent toss of the ball to the same height and position will help improve one's serve, and the toss of the ball comes about from the rise of the arm and the release from the fingers to propel the ball upward. Piano playing really helps develop the feel and dexterity in the hands that help this action. And does tennis help one's piano playing? There I think the answer is more general. Playing the piano requires good concentration and consistency in timing throughout an entire piece. Depending on the length of that piece, good physical conditioning, breathing, posture, etc., have a less direct, but nevertheless, general benefit to aid piano playing. Lastly, the interplay as between dance and piano are also obvious. Both activities require a sense for timing and rhythm. No amount of good footwork, fancy moves, or body movement can compensate for a dancer who is "dancing out of beat" to the music. As in piano playing, a dancer who dances to the music, and can shorten or lengthen his step in tune with the beat adds great beauty to his dancing. For example, in the slow waltz, where one bar is three beats, one can of course dance a standard 3 step of one beat each. However, if a dancer can "borrow" a half-beat from the 3rd beat and thereby extend the second step to a beat and a half, and quickening the 3rd step to a half-beat, this delay action on the second step adds beauty and control to the slow waltz. 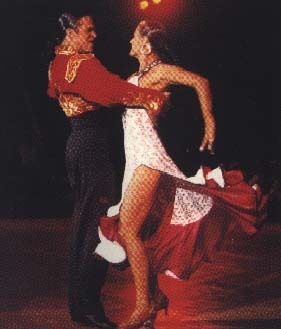 While rumba is viewed as a slow and rhythmic dance, dancing to the beat is very important, because the music has 4 beats to the bar, whereas the rumba has only 3 steps to a bar of music. The rumba 3 step should be danced to beats 2, 3, and 4, and there should be a momentary freezing of body motion, or at most a shift of weight on beat 1, before steping sharply and smartly into step 1 on beat 2. There should not be a continuous motion from step 3 into step 1 going through beat 1 of the music. Piano playing is ideal for helping one to be highly attentive to the timing, bars, and beats of the music. My purpose in writing about this was merely to demonstrate how one activity effects and influences the others, and how each helps me improve on the other. The effect is equally apparent as between any other sport, for example golf, and dancing, or with some other form of instrument playing such as guitar. I merely talk about tennis, dance, and piano playing, because that is what I do regularly and enjoy doing. Each helps me in various ways to develop and improve confidence, health, and well-being. And a final word - it is never too late to start something new, because one may very well find that what one has been doing (something old) will transcend easily into that something new.